It is the installer's responsibility to verify correct fitment for your wheels. Visually verify before installation and contact us or the wheel manufacturer to verify proper fitment. To reduce your cost, Brandsport offers this item in Bulk (sold here individually). Gorilla also lists this same item in 4-piece sets as Display Package # 31127 and Bag # 31127B. If you don�t see what you are looking for here, search all of our Lug Nuts here. 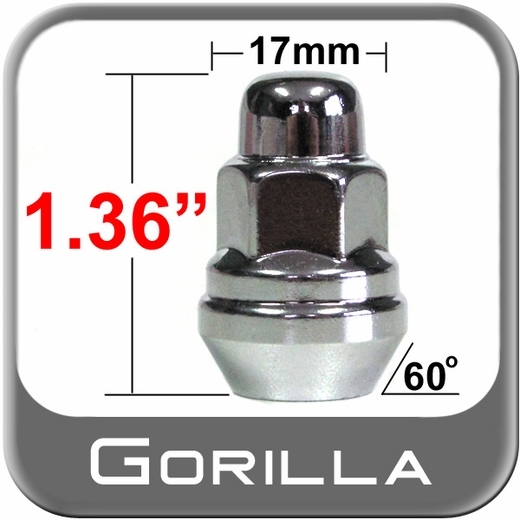 Keep driving with a lustrous chrome finish that lasts decades. .
High quality tempered steel is used in the processing of each 12mm x 1.25 Gorilla lug nut. Precision engineered to ensure a perfect fit and hence, good driving experience.